The proposed Roots Handmade Pizza and Bleeding Heart Bakery & Cafe restaurants at 1916-24 W. Chicago Ave. get a close look in the latest East Village News, including comments from news.eastvillage.org and facebook.com/eastvillagechicago. 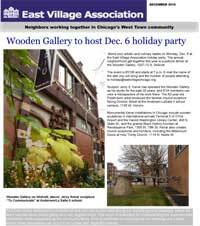 The newsletter also invites members to the annual East Village Association holiday party Dec. 6 at Wooden Gallery, 1007 N. Wolcott, looks at vintage window restoration, and provides updates on the Chicago Bowl concert space at 1850 W. Chicago and the former St. Boniface Church at 1358 W. Chestnut St. The December 2010 issue can be downloaded here. The newest EVA News advertiser is Panon Service of Chicago. Dec. 4 Wicker Park Choral Singers look to the sky with the concert “Star of Wonder” at 3 p.m. in Wicker Park Lutheran Church, 1502 N Hoyne. Renegade Craft Fair Holiday Sale at Pulaski Park. 1419 W. Blackhawk St.